OAKLAND – The Warriors spent Thursday night handing out gifts to themselves, offering practically nothing for the New York Knicks. Credited with assists in their first 36 baskets, taking the streak deep into the third quarter, the Warriors befuddled a patchwork band of Knicks en route to a 103-90 victory before a sellout crowd (19,596) at Oracle Arena. Three Warriors scored in double figures, led by Klay Thompson’s 25 points. 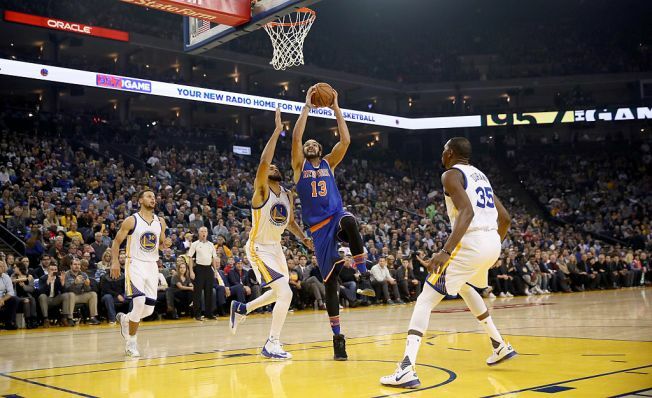 JaVale McGee put in 17 points and Kevin Durant added 15 as the Warriors methodically but sloppily finished off the Knicks. The Warriors (23-4) totaled 41 assists – their third game this season with at least 40 – on 45 baskets and shot 46.9 percent from the field. The Knicks (14-12) were playing without All-Stars Carmelo Anthony and Derrick Rose. Ex-Warrior Justin Holiday scored 15 points to lead New York. No individual stood out above the others, by design it appeared, so honors go to the player who posted a season-high: McGee. McGee’s line: 17 points (8-of-10 from the field, 1-of-3 from the line), two rebounds, one assist and one block. Starting at center for Zaza Pachulia, McGee played 16 minutes and was plus-13 for the game. Durant came within two assists of a triple-double, finishing with 15 points, 14 rebounds and eight assists. Stephen Curry came within two assists and 2 points of a triple-double, submitting 8 points, 10 rebounds and eight assists. When New York closed to within five (42-37) on a Kristaps Porzingis jumper with 5:52 left in the first half, the Warriors responded by closing the half on a 17-8 run for a 59-45 lead at the half. The Knicks trailed by double digits the rest of the game, with Warriors pushing the lead as high as 25 in the second half. Warriors: C/F David West sustained a right hip contusion and left the game in the third quarter. C Zaza Pachulia (R wrist contusion) was listed as doubtful and ruled out prior to tipoff. C Damian Jones was a healthy inactive. Knicks: F Carmelo Anthony (R shoulder soreness) and G Derrick Rose (back soreness) were listed as out. The Warriors return to action Saturday night, when they face the Portland Trail Blazers at Oracle Arena. Tipoff is scheduled for 7:40.